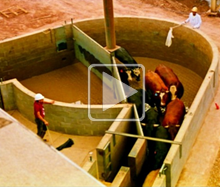 For more than 50 years, the College of Agriculture at California State University, Chico has impacted the quality of life in California and across the nation by educating and equipping agricultural leaders who have the theoretical knowledge, practical experience, and decision-making ability that allows them to excel in their chosen career. The close, friendly nature of the College, combined with an integrated agricultural curriculum and remarkable access to hands-on education, creates a fertile learning environment for our students and the agriculture industry we serve. 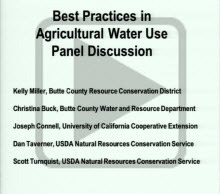 A panel of water experts discusses the importance of wise water use and how such uses are being implemented locally. In particular, information is provided about programs offered by the Natural Resource Conservation Service. This event is part of a series of events around the CSU, Chico/Chico Community Book in Common, “Unquenchable: America’s Water Crisis and What to Do About it,” by Robert Glennon. Dr. Temple Grandin is an internationally-known animal behavioralist. Her accomplishments earned her a place among Time Magazine's "100 Most Influential People in the World" in 2010. During her sold-out speaking engagement at CSU, Chico, the focus of her talk was improving animal welfare through awareness of how and why animals behave the way they do when handled by humans. In addition to her expertise in animal behavior, Dr. Grandin is perhaps the most accomplished and well-known adult with autism in the world. Her life story was the subject of the acclaimed 2010 HBO biography, "Temple Grandin," winner of seven Emmy awards and a Golden Globe. 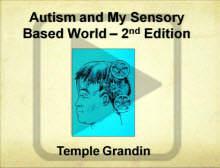 In this talk, she shares information that has been learned about autism through scientific research and also conveys practical ways of relating to autistic children and adults. She describes her thinking process as an individual with autism as sensory or "bottom up thinking."